Heat oven to 450°F. Spray cookie sheet with cooking spray. Remove pie crust from pouch; place flat on cookie sheet. If desired, decoratively flute edge. Bake 8 minutes or until light golden brown. Meanwhile, in 12-inch nonstick skillet, mix soup and milk. Cook over medium-high heat, stirring frequently, until bubbly. Stir in chicken, potatoes, frozen mixed vegetables and pepper. Return to boiling. Reduce heat to medium-low; cover and simmer 8 to 10 minutes, stirring occasionally, until thoroughly heated. Remove skillet from heat. 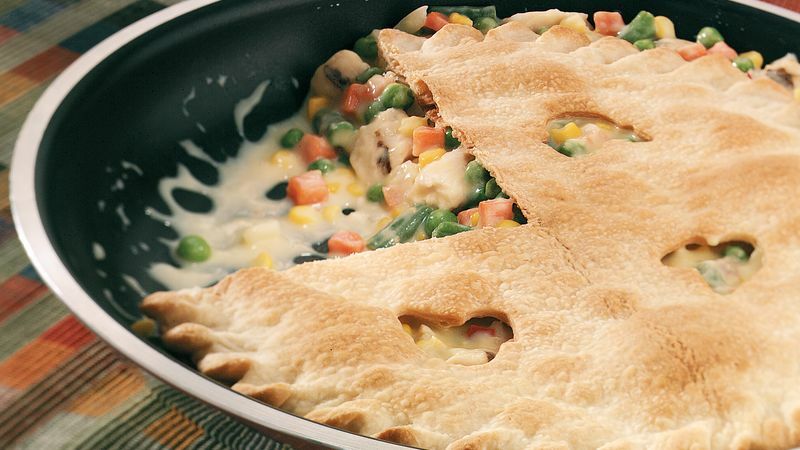 With large pancake turner, place baked pie crust on top of chicken mixture. Cut into wedges to serve.